Over the past year we continued to forge partnerships, supported and strengthened initiatives, and advocated to governments and organizations to help make the policies, systems and change efforts affecting young children serve them and their families better. I am proud of our learning and progress in the four outcome areas identified in our 2015-2020 Strategic Plan: Family Supports, Communities, Early Care and Education Systems, and Health-Related Systems. And while we have a ways to go, we know this for sure – First 5 LA is focused on impact at scale. Our “North Star” is that every child in L.A. County will enter school ready to succeed in school and life. What’s that going to take? It’s going to take changing practices and service delivery to be child-centered, family-strengthening and sustainable. It will take working in partnership with county agencies and diverse stakeholders who share our aspirations for young children and their families. It will call on changing community norms, attitudes and public policies to ensure young kids are a budget and legislative priority. On Thursday, June 14, we will ask the First 5 LA Board of Commissioners to approve our proposed 2018-2019 fiscal year budget of $139.99 million, of which $117.1 million represents furthering our key program investments. While this amount is relatively consistent from last year’s budget, we are dependent upon tobacco tax revenues. And that revenue source is declining. To make a greater impact for all children, we must continue to do more with less, and excel as “agents of scale” to advance our goals and advocacy for lasting change. The budgets we are requesting in our four outcome areas – $40.8 million for Family Supports, $20.9 million for Communities, $23.2 for Early Care and Education Systems, and $3.6 million for Health-Related Systems – can be explored in greater detail at the “meeting materials” section of website. 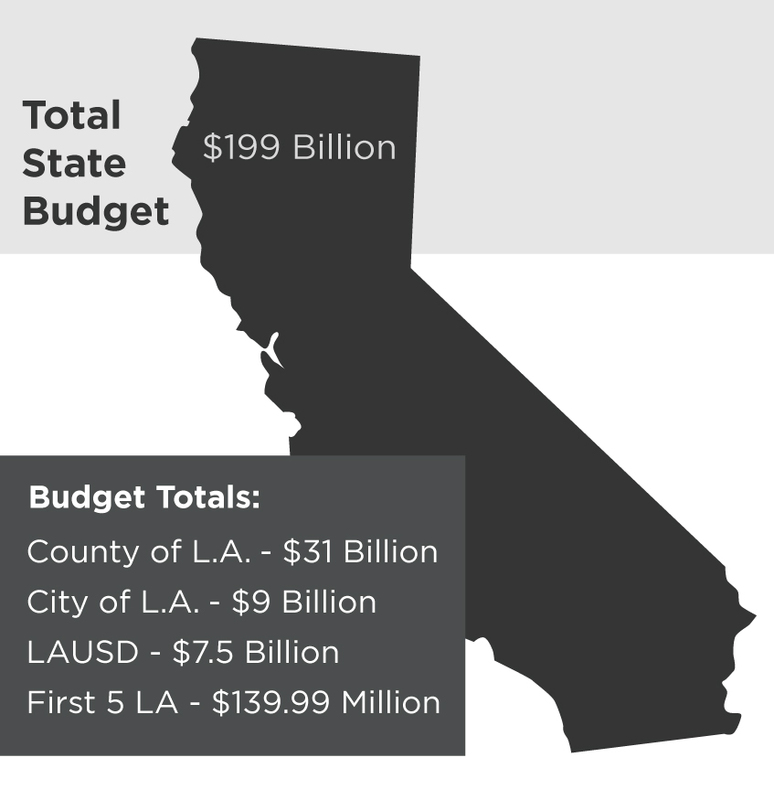 This budget will help First 5 LA stay the course. But it will take more than our budget alone to expand our reach. I ask you to imagine the exponential impact we could have on kids if the work we do was scaled up through just a fraction of state, county, city and district funds. We’re getting there. As the State of California developed its budget, First 5 LA supported the Governor and Legislature’s efforts to invest the first-ever State-level support of home visiting for CalWorks families. While it’s working its way to the Governor’s desk for his final signature, this investment totals $26.7 million in Temporary Assistance for Needy Families (TANF) dollars per year through 2021, and then subject to appropriations thereafter. What we have accomplished here locally – with home-based support and coaching programs for pregnant women and families with new babies though our own Welcome Baby program, and other home visiting providers like Healthy Families America and Parents As Teachers – was a key informer through the budget process this year, we were at the table and helped shape the proposal from our shared learnings. This is one step in the right direction, but more steps will need to be taken since only two percent of the Californians with infants and toddlers who greatly need these services have access to them. As part of our ongoing advocacy efforts, we are urging leaders and lawmakers at the state levels to make similar commitments to support the safe, healthy development of young children. The projects we fund, we hope, can be seen as a model of what can work and we look to these larger public agencies to bring these programs and services to scale. Perspective helps. Also at this month’s Board meeting, we’ll get the latest on First 5 LA’s systems-building efforts when Deborah Daro, a national expert on child abuse prevention policy and early home visiting research, discusses the parent-child strategy of home visiting, thinking beyond funds to expand and sustain, and agencies sharing responsibility to enhance the context in which parents raise their children. L.A. County Supervisor and First 5 LA Commission Chair Sheila Kuehl summed it up perfectly when she said, “Budgets tell a story of organizational priorities, vision and values.” First 5 LA’s story about the future of our children says this work is bigger than any one of us; and before the vision of their better, stronger and more equitable future can become reality, we have to be more strategic, effective and collaborative. We can’t afford not to. First 5 LA’s re-positioning in strategy and as a learning organization is evolutionary and calls on our clear attention to building knowledge and resource tools needed by parents and families so that children benefit from their best start possible. Yet, it also calls for a budget with built-in capacity to be nimble, responsive and ready if and when opportunities and unexpected threats to child well-being emerge. Ours is a forward-thinking agenda – intent on the strong futures of our children, comprised of experts leaning into new knowledge. As a learning organization, we are advancing the importance of recognizing and replicating practices that make the greatest impact, sharpening our narrative to spotlight systems change in action, and tracking our progress against our Strategic Plan. All with the goal of informing our strategies so that policies and change systems that measure progress toward our outcomes and continuously inform organizational performance and improvement never lose sight of our singular purpose for being – building better futures for L.A. County’s youngest children.